Another awesome open access (FREE!) 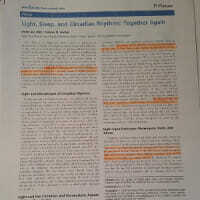 article! The 24-hour (h) light–dark (LD) cycle is a fundamental characteristic of Earth’s environment and so its powerful influence on the behaviour and physiology of animals and humans that evolved on this planet is not surprising. 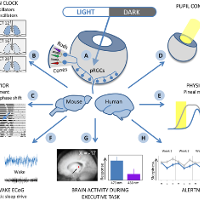 In addition to influencing the perception of visual images, light coordinates the temporal rhythms of physiology and behaviour by sending signals to structures in the brain that contain the central circadian clock. These signals are mediated in part by melanopsin, a photopigment found in the retina. Light affects the brain through these nonvisual pathways, and scientists have recently begun to realize just how pervasive these nonvisual effects are. Mounting evidence supports the view that the effects of light on sleep and brain activity during wakefulness, as well as the duration of sleep and the homeostatic response to sleep loss, depend on both melanopsin and circadian time.